Grease an 8x8 pan with 1 tablespoon butter, then add one tablespoon of sugar to the pan and shake it around to dust the entire buttered pan with sugar. Set to the side. In a large mixer, cream butter and both sugars on a medium speed until creamy and fully incorporated. Then add in peanut butter and mix on medium till combined. Add in egg and vanilla. Mix to combine. In a separate bowl mix together flour, baking powder and salt with a fork. Add flour mixture to peanut butter mixture. Dough will become crumbly and look like little balls. Add in the milk and mix until fully combined. Pour mixture into prepared pan, and smooth batter with the back of a spoon to even out batter. Bake for 45 minutes or until a tooth pick inserted into the center comes out clean. Allow to cool for 30 minutes then slice it up into squares. Enjoy! Greasing the pan with both butter and sugar will keep the bread from sticking and give the bread a nice sugary coating. 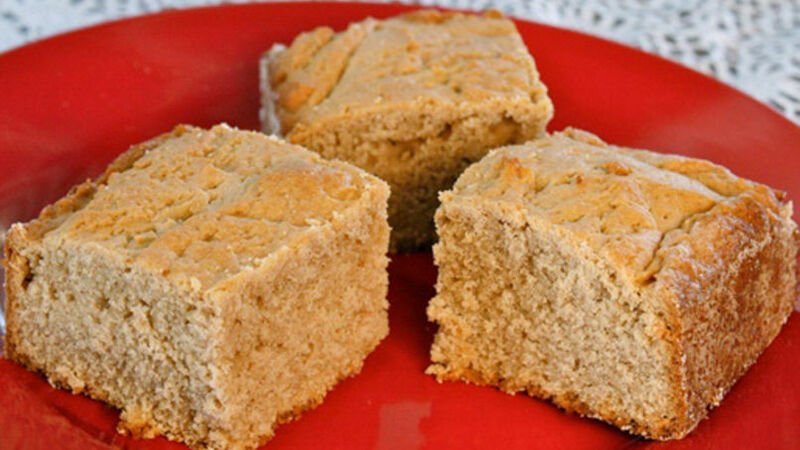 I was a peanut butter bread fanatic in high school. I was like a serious hound dog with my sense of smell on an elevated level. As I walked to homeroom I would take a big sniff in the air to see if the cafeteria was delivering peanut butter bread to the students that day. On the days when my nose would tell me yes, I would make a mad dash from homeroom to nutrition in order to get first dibs on the line and get my warm peanut butter bread in my hands that much faster. It was such a big deal to me then and still is as an adult. I love that the top of the bread bakes hard while the inside remains soft to the bite. I like cutting a slice warm and spreading a dollop of jelly on top. It is wise to keep a big glass of milk nearby. The moist bread not only tastes like a peanut butter sandwich; it gets stuck to the roof of the mouth like one, too. Like I said, keep a glass of milk nearby… you'll need it!